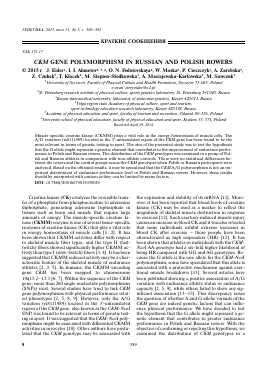 CKM GENE POLYMORPHISM IN RUSSIAN AND POLISH ROWERS - тема научной статьи по биологии из журнала "Генетика"
Muscle-specific creatine kinase (CKMM) plays a vital role in the energy homeostasis of muscle cells. The A/G variation (rs8111989) located in the 3'-untranslated region of the CKM gene has been found to be the most relevant in terms of genetic testing in sport. The aim of the presented study was to test the hypothesis that the G allele might represent a genetic element that contributes to the improvement of endurance performance in Polish and Russian rowers. The distribution of the CKM genotypes was examined in a group of Polish and Russian athletes in comparison with non-athlete controls. There were no statistical differences between the rowers and the control groups across the CKM genotypes when Polish or Russian participants were analyzed. Based on the obtained results, it may be speculated that the CKM A/G polymorphism is not an important determinant of endurance performance level in Polish and Russian rowers. However, these results should be interpreted with caution as they can be limited by many factors. group of Polish and Russian athletes in comparison with non-athlete controls. All procedures followed in this study meet the ethical standards in Sport and Exercise Science Research approved by appropriate local Ethics Committees. 127 Polish male rowers (27.5 ± 5.3 yr; both former and current competitors) were recruited for this study. The whole group ofPolish rowers included 21 athletes classified as "top-elite" (gold medalists in the World and European Championships, World Cups or Olympic Games) and 23 athletes classified as "elite" (silver or bronze medallists in the World and European Championships, World Cups or Olympic Games). An additional 49 athletes were classified as "sub-elite" (participants in international competitions). The others (n = = 34) were classified as "non-elite" rowers, all regional competitors with no less than 4 years of experience participating in the sport. For Polish controls, the samples were prepared from 684 volunteers (students from the University of Szczecin, 20.6 ± 0.9 yr). The athletes and controls were all Caucasians to avoid racial gene skew and to overcome any potential problems of population stratification. For the second part of the study, 93 Russian rowers (21.9 ± 3.8 yr) of a regionally or nationally competitive standard were recruited. There were 4 athletes classified as "top-elite", 44 athletes classified as "elite", 45 athletes classified as "sub-elite". Russian controls were 1170 healthy unrelated citizens of St. Petersburg, Moscow and Kazan (18.5 ± 2.2 yr) without any competitive sport experience. The athletes and control groups were all Caucasians. morphism by PCR and restriction enzyme digestion method . PCR primers were forward 5'-GGG ATG CTC AGA CTC ACA GA-3'; reverse 5'-AAC TTG AAT TTA GCC CAA CG-3', generating a fragment of 359 bp. PCR products were digested with Bspl9I restriction endonuclease (SibEnzyme, Russia). A x2 two-sided test or x2 test with Yates correction for small groups were used to compare the CKM alleles and genotype frequencies between athletes and control subjects. The level of statistical significance was set atp < 0.05. All CKM genotype distributions for both athletes and controls met Hardy—Weinberg expectations (p > > 0.05 in all groups tested separately). The distributions of the CKM genotypes and alleles in Polish and Russian athletes and controls are given in table. The study revealed no statistical differences in the observed allelic and genotypic frequencies of the CKM A/G polymorphism between cases and controls, indicating no significant associations between the CKM DNA sequence variants and athletic status among rowers. CZARNIK U., GRZYBOWSKI G., KAMINSKI S., STRYCHALSKI J., ZABOLEWICZ T. — 2009 г.
KOWALEWSKA-LUCZAK I., KRUSZYSKI W., KULIG H., ZUKOWSKI K. — 2013 г.
AZARI M.A., HASANI S., HEIDARI M., KHANAHMADI A., ZEREHDARAN S. — 2012 г.
KOWALEWSKA-LUCZAK I. — 2009 г.